A cold and emotionless killer for whom every soul has a price, even his own, embarks on a path to find out just how high that price can be. A dark elf of limitless guile dares to challenge a king, and carve for himself a place in the inhospitable World Above. Hostile in ways that a surface-dweller could never know, the tunnel-mazes of the Underdark challenge all who tread there. Among these souls are Drizzt Do'Urden and his magical cat, Guenhwyvar. 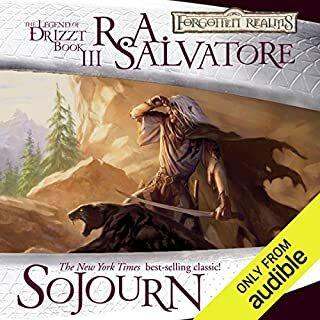 Exiled from his drow homeland, Drizzt must fight for a new home in the boundless labyrinth. Meanwhile, he must watch for signs of pursuit - for the dark elves are not a forgiving race. 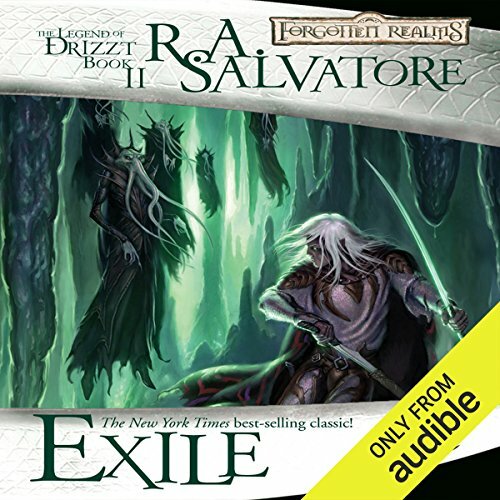 ©1990 TSR, Inc., c. 2004 Wizards of the Coast, Inc. (P)2013 Audible, Inc.
fabulous, can't get enough of drizzt! loved it, can't wait to get to part 3, took a while to get used to the narrator's voice but the d&d story is amazing. This book is a rollercoaster of experiences. 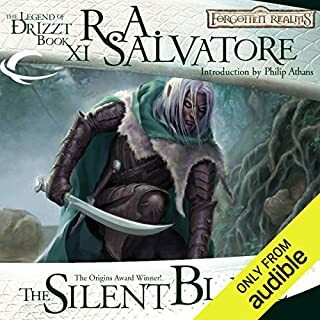 Hardship, personal loss, and a heroic choice make this a worthy part of The Legend of Drizzt. For those interested in the fantasy realm, this book is definitely for you! well narrated! my wife and I just love this series. cannot wait to start the next one! The writing is a bit, I don't know, perhaps unsophisticated. It comes off as a teen novel. The author relies on self-evident or circular descriptions. "He uses his most amazing amazingness to amaze the amazed crowd"... An exaggeration, obviously, but too frequently I found myself frustrated by redundant, circular or self-evident phrases. Characters are pretty generic and don't really engage the reader much. Plot is decent, but not groundbreaking. I have been waiting for the release of this book since I finished listening to the first one; I read these long ago, and it was like visiting an old friend! I now find myself waiting for the final book in this trilogy. As before, listening to it, I heard parts of the story I had forgotten or didn't remember and Victor Bevine did an excellent job keeping my ear tuned to the story no matter what I happened to be doing. What did you love best about Exile? 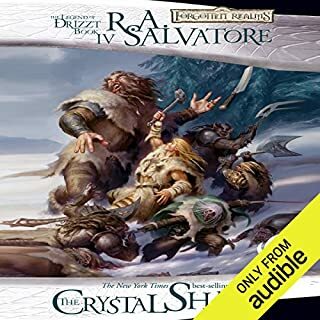 Drizzt and Belwar's exploration and journey through the Underdark. 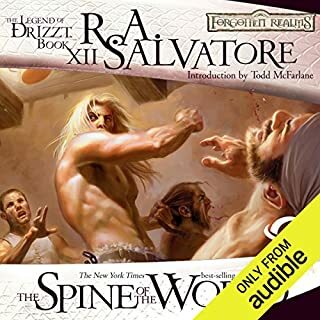 I was introduced to Drizzt Do'Urden and got to know him a little bit in "Homeland", but it's in "Exile" that I became emotionally invested in Drizzt and his moral integrity. His willingness to sacrifice to help his friends and, sometimes, even strangers is an example of his heroic nature. And that even though he dwells in the depths of, seemingly, a hell of world in Menzoberranzan, in the Underdark, he never gives in to the darkness but instead holds true to his standards and ideals. Drizzt Do'Urden of course. But I also like his protrayal of Belwar Dissengulp, he really brought that character to life for me. Yes, it was hard to stop because I wanted to know what happen next. 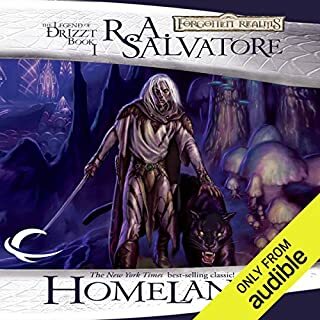 "Homeland" started in a measured pace as we were introduce to the world of Menzoberranzan and gradually picked up with the emergence of Drizzt. In "Exile", there was no need for conservativeness. The action starts of with a bang and bangs you to the end. 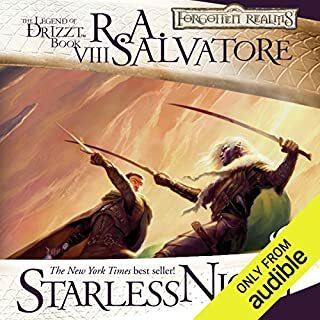 This is the second book in the series, and book begins with Drizzt's exile where he has chosen to exile himself due to differences with his family as well as drow society in general. Time away from any social interaction takes a deep toll on Drizzt's psyche which is discussed in a lot of detail. 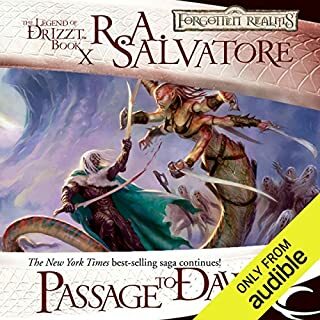 Author continue to flush out the character, and readers gets to know Drizzt at a deeper level. 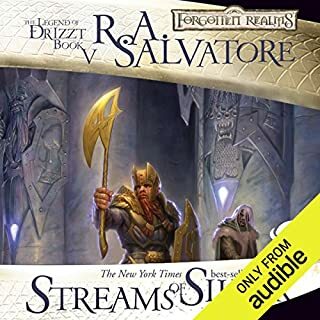 His thought process, his principles and decision making is been discussed in more details that book is more focused on Drizzt than his environment. Book introduces new races and their cultures which provide more contrast to the drow society. Drizzt's interaction with these races provides good action and entertainment. Drizzt's friendship explored in this book also provides good depth that it is put to test as dark elves hunt Drizzt to appease their deity. Narration is the same as the first book. Though, not the best, It is well done and does add to the experience. I find this book to be better written and more enjoyable than the first one, so I recommend this book. I look forward to pick up the next book when it is out. The second book in this trilogy picks up virtually right where the first one left off. 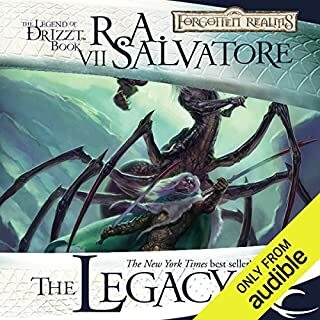 Although 10 years have elapsed in the interim, little has changed except that Drizzt has been surviving on his own and has grown even harder and tougher. This book had a good mix of action and character development. While the plot didn't introduce much in the way of new or unexpected ideas, it still kept me listening without getting boring. Personally though, I didn't care too much to hear anymore about the Drow still living back in Drizzt's homeland. 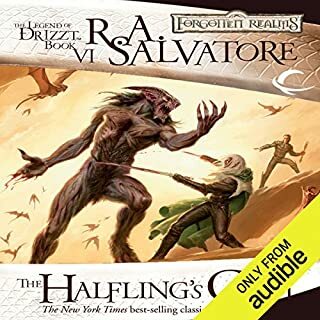 Since this series is my introduction to the whole Forgotten Realms world, I wanted to see Drizzt make it on his own in new environments, discovering things along with him. The snaps back to Menzoberranzan were therefore unwanted and jolting. 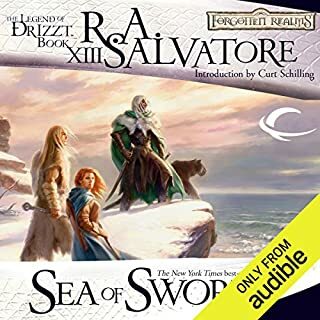 I understand though that most of the books happen on the surface, and that this series was written later specifically to detail Drizzt's former life. To that extent I think it accomplishes its task well, and achieves some nicely satisfying moments as well. It's not epic fantasy or anything, but it's a good diversion of a story. Book 2 is as good as Book 1! 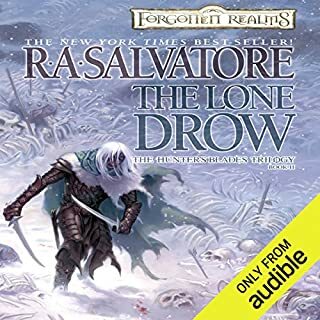 This is book 2 of the story of Drizzt, and it did not disappoint me. 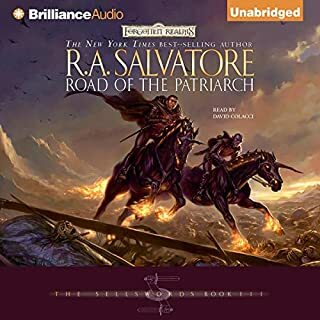 R A Salvatore writes so much detail into his stories that I can believe I am actually there, watching. Victor Bevine brings the characters to life, and the action is non-stop. Magic flies almost as much as arrows! 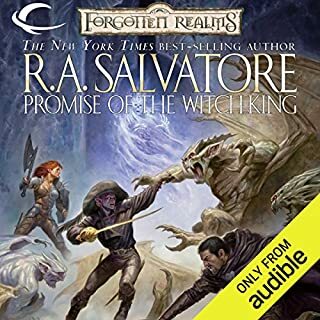 One of the best authors in fantasy.Fast paced action.Quest of an unusual hero.The narrator is very suited to this style.If you like fantasy,I highly recommend this series. Slow at the start, but worth the wait! 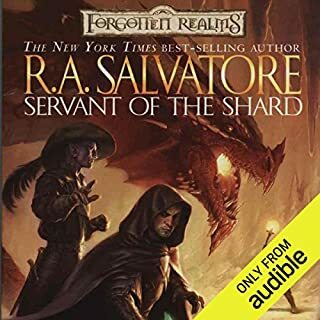 I found the beginning to be over detailed but once the story focused in on Drizzt, it became very engaging. I already have started on the second of the Trilogy. Couldn't wait for my monthly credits this time. Where does Exile rank among all the audiobooks you’ve listened to so far? this book was just as awesome as the first. Belwar Disigulp, Zaknafain, an of course Drizzt. This book has a lot of heart, and lots of action. Check it out. It is worth it. Would you consider the audio edition of Exile to be better than the print version? Haven't read the printed version. The character and universe development of every character, making it feel like a fully fleshed out world. Many but that would spoil it. Bought the book shortly after completing the first one in the trilogy. The second continues a great story with excellent narration. Compared to the first, I found the story lagging behind on the first one slightly. 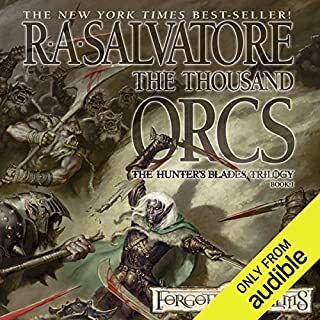 Whereas the previous book spent a lot of time in Menzoberranzan watching Drizzt grow up, giving you a lot of background on many characters, this one is spent mainly in the various locales of the Underdark. It moves the focus from Drizzt and his family, to Drizzt and the creatures he encounters. This allows for more action, but less story progression. The first book spanned several dozens of years. This one feels way more confined in that regard. I felt the scenes in Menzoberranzan were less interesting now that the focus character of the book isn't actually in the city. The excellent writing and great scenes more than made up for the slower story pacing though. A fantastic book that makes me eager to listen to the next one. Great fantasy book where good and evil is sometimes easy to spot, yet hard to define. Here we learn more about the Underdark and the creatures and monsters that live there. The book starts off 10 years later from where it left off in Homeland. Drizzt finds new friends and still has old enemies after him to contend with. Again the world building is excellent. 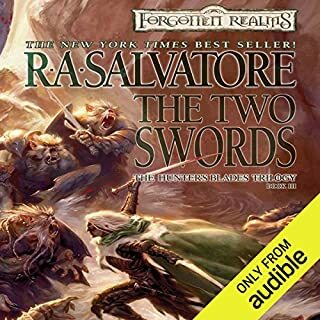 The first book is has a lot of different character building, in the second the focus is more on Drizzt and his perceptions. 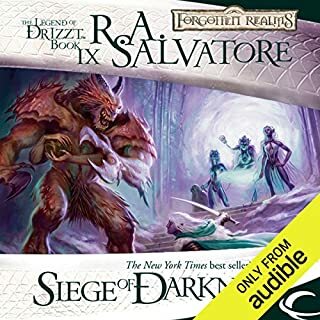 Author leaves off with the promise of new adventures for Drizzt and anticipation for the reader in the next segment of this trilogy. Narrator has a clear concise voice and is pleasant to listen to.